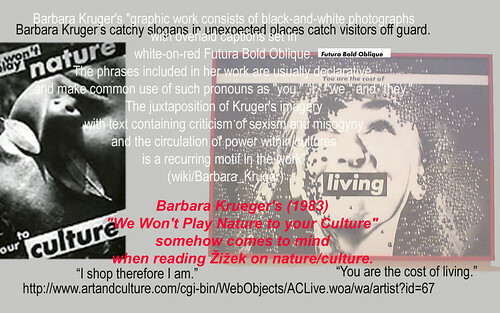 Barbara Krueger’s (1983) “We Won’t Play Nature to your Culture” somehow comes to mind when reading Žižek on nature/culture. During breaks I would walk through empty rooms to discover changes curators had made in their spaces. I was a teenager when I began to feel at home in the silent, often light-filled buildings that held public art collections. I was annoyed by, resented, then was intrigued by, read about, studied, spent time with pieces that came to be my favourites. Visual artists were deeply informed about and experimenting with emerging, complex theories, cultural studies, political philosophy . . . academics did their best to avoid them until it became impossible to do so. Reading Slavoj Žižek’s Organs without Bodies is a lot like my non-linear NGC meanderings in the 1990s. His writing provokes me but there is enough brilliance there that makes me keep his book in the reading stand beside my monitor, opened at different pages on different days. He is not a lazy thinker. Each page is like a hypertext reader indexing a myriad of artists, philosophers, scientists and entrepreneurs. He discusses Hawkins, Hegel, Heidegger and Hitchcock with equal comfort because he has actually ‘read’ and analysed’ their work. I was drawn to his chapter section on hyphen-ethics more because of the probing, unsettling questions it raises than because of his conclusions. It will be one of those recurring themes that will be part of my own lifelong teaching, learning and research. Slavoj Žižek is a dialectical-materialist philosopher and psychoanalyst. He also co-directs the International Centre for Humanities at Birkbeck College. The Parallax View appeared last year. Žižek, Slavoj. 2004. “Against hyphen-ethics.” Organs without Bodies: on Deleuze and Consequences. New York/London: Routledge. pp. 123-132. Žižek, Slavoj. 2003. “Bring me my Philips Mental Jacket: Slavoj Žižek welcomes the prospect of biogenetic intervention.” London Review of Books. 25:10. May. Žižek, Slavoj. 1999. “Attempts to Escape the Logic of Capitalism.” Review of Vaclav Havel: A Political Tragedy in Six Acts by John Keane.” London Review of Books. 21:21. October 28. Žižek, Slavoj. 1999. ‘You May!’ London Review of Books. 21:6. 18 March. 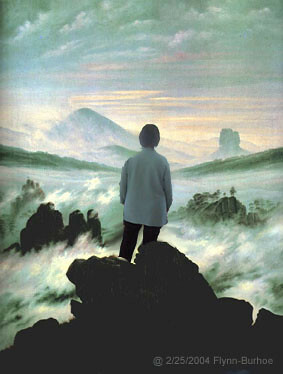 In 2004 just before I became totally lost in my cybernarcosis, cyberdeliria, enraptured by the deep internet I played with the digital image of the foremost German Romantic landscape painter David Casper Friedrich’s (1774-1840) Wanderer Overlooking the Sea of Fog (1818 ) His anti-classical work was part of a new synthesis of art, philosophy, and science focusing on the natural world which seemed somehow embued with the spiritual experiences of life. Friedrich’s timeless depiction of a wanderer looking out over a sea of fog evokes the journey of life towards higher more difficult summits. I enjoy the irony that the man depicted in his original image was a mere warden, not a world traveller. David Casper Friedrich gained the admiration of the poet Goethe, “the initiator of the tradition of the Bildungsroman, the novel of formation” (more). “In Wilhelm Meister’s Apprenticeship the protagonist undergoes a journey of Bildung, or self-realization” (more). Bildung is the painful struggle to form/educate one’s natural dispositions through which an individual develops his/her moral identity. Jantschek, Thorsten. 2001. “Ein ausgezehrter Hase.” Die Zeit. July 5. Stephen Colbert patented the WORD unquisition in honour of Onfray. He describes the work of unquisitionists as, “Missionary secularists [who] are working hard to convince the faithful not not believe what they don’t.” (Colbert 2007). Karen Armstrong, a prominent British author on religion, claims that missionary secularism mimics the ardor of Christianity, Islam and Marxism, all of which have at their core an urge to convert nonbelievers to their world view (Higgins 2007 ). Michel Onfray chose Delacroix’s Jacob Fighting the Devil for the cover of his controversial book entitled Atheist Manifesto: The Case Against Christianity, Judaism, and Islam (2007). It is one of a series of publications that are part of the rise in missionary secularists’ Atheist manifestos such as Sam Harris’ Letter to a Christian Nation, and Richard Dawkins’ The God Delusion, Michel Onfray’s Atheist Manifesto: The Case Against Christianity, Judaism, and Islam. and Christopher Hitchens’ God is Not Great: How Religion Poisons Everything. Michel Onfray, who has a enormous cult following as philosopher and high-priest of atheism, advocates work by Marx, Foucault, Nietzche, Gilles Deleuze, and Jeremny Bentham instead of the Bible or the Koran. His interview with Nicolas Sarkozy on Philosophie Mag has an enormous impact. D’un côté, un philosophe athée, antilibéral, hédoniste et libertaire. De l’autre, un candidat à la présidentielle n’hésitant pas à remettre en cause la loi sur la séparation de l’Église et de l’État, un ministre de l’Intérieur rêvant au rétablissement de l’autorité. À notre initiative, les deux hommes se sont rencontrés. On s’attendait à un choc frontal, il a été question de la croyance, du mal, de la liberté, de la transgression (Nicolas Sarkozy et Michel Onfray: Confidences entre Ennemis). Totem et Tabou, je vous l’offre parce que Sigmund Freud y traite du meurtre du père et de l’exercice du pouvoir dans la horde. L’Antéchrist de Friedrich Nietzsche, pour la question de la religion, la critique radicale de la morale chrétienne à vous qui, parfois, allez à la messe en famille. Michel Foucault, c’est une lecture que je recommande plus particulièrement au ministre de l’Intérieur, adepte des solutions disciplinaires. Dans Surveiller et punir, Michel Foucault analyse le rôle du système carcéral et de l’emprisonnement, puis de leur relation avec la norme libérale. Pierre-Joseph Proudhon, enfin, car il montre qu’on peut ne pas être libéral sans pour autant être communiste (Nicolas Sarkozy et Michel Onfray: Confidences entre Ennemis). Delacroix’ painting Jacob Fighting the Devil is visible on this theatrical poster for Director Sally Potter’s (1997) film The Tango Lesson. Poster provided through Wikipedia by Sony2. 1. This is a file from the Wikimedia Commons. This illustration was made by Gloumouth1. Please credit this : Gloumouth1, http://gloumouth1.free.fr (An email to gloumouth1 at laposte.net would be appreciated too). 2. Wikipedia advises that the use of scaled-down, low-resolution images of posters to illustrate the film, event, etc. in question or to provide critical analysis of the poster content or artworkEnglish-language Wikipedia, hosted on servers in the United States by the non-profit Wikimedia Foundation, qualifies as fair use under United States copyright law. Any other uses of this image, on Wikipedia or elsewhere, may be copyright infringement. See Wikipedia:Non-free content for more information. To the uploader: please add a detailed fair use rationale for each use, as described on Wikipedia:Image description page, as well as the source of the work and copyright information. Fair use rationale:This image is being used to illustrate the article of the movie in question and is used for informational purposes only. This image is of low resolution. It is believed that this image will not devalue the ability of the copyright holder to profit from the original work. Image used for comment, reporting, and teaching qualifies as Fair Use. Colbert, Stephen. 2007. Unquisition. May 3. Hitchens, Christopher. 2007. God is Not Great: How Religion Poisons Everything. Twelve/Warner Books. Kinsley, Michael. 2007. “In God, Distrust.” Sunday Book Review. New York Times. May 13. Onfray, Michel. Atheist Manifesto: The Case Against Christianity, Judaism, and Islam. Higgins, Andrew. 2007. “As religious strife grows, atheists seize pulpit.” Northwest Herald. >> nwherald.com. April 13.